Democrat Bill Dodd currently represents Assembly District 4. Dodd is running for State Senate in 2016 and will be giving up this seat, making it an open seat. This seat is expected to be won by a Democrat. Bill Dodd was elected in November of 2014 to represent California’s 4th Assembly District. This district includes all or portions of the counties of Colusa, Lake, Napa, Solano, Sonoma and Yolo and the cities of American Canyon, Calistoga, Clearlake, Davis, Dixon, Lakeport, Napa, Rohnert Park, St. Helena, Williams, Winters, Woodland and Yountville. 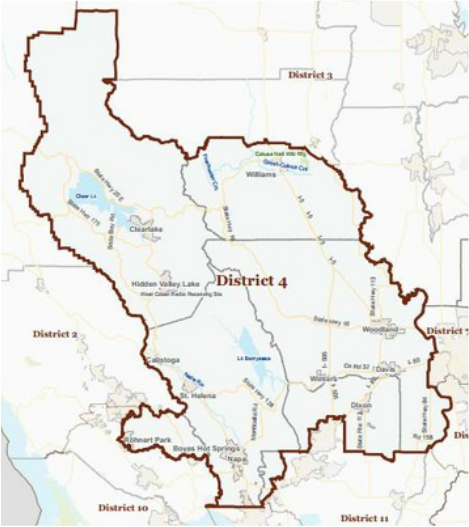 The 4th Assembly District also includes the communities of Allendale, Angwin, Arbuckle, Boyes Hot Springs, Clarksburg, Clearlake Oaks, Clearlake Riviera, Cobb, College City, Deer Park, Dunnigan, Eldridge, Esparto, Fetters Hot Springs- Agua Caliente, Glen Ellen, Green Valley, Grimes, Guinda, Hartley, Hidden Valley Lake, Kelseyville, Kenwood, Knights Landing, Lower Lake, Lucerne, Madison, Middletown, Monument Hills, Moskowite Corner, Nice, North Lakeport, Oakville, Rutherford, Silverado Resort, Soda Bay, Spring Valley, UC Davis, Upper Lake and Yolo. Prior to his election to the Assembly, Dodd served as a supervisor on the Napa County Board of Supervisors (2000—2014). Assemblymember Dodd is heavily involved in local charities. He was honored in 2014 by the Napa Chamber of Commerce as its citizen of the year for his work in raising over $3 million for local charities to help those who need it the most. As a founder of the Wolfe Center, a youth drug and alcohol rehabilitation center, and founding director of the Napa County Children’s Health Initiative, Dodd led numerous campaigns for these organizations. The Assemblymember graduated from California State University, Chico. He went on to own and operate one of the largest full-service Culligan Water operations in California. Bill and wife Mary, have five grown children and four grandchildren.